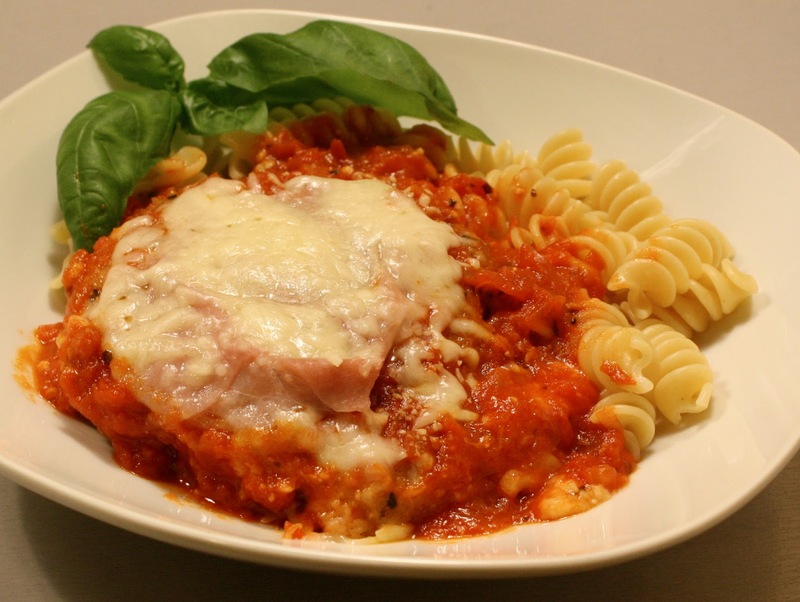 Here is our spicy take on the Italian classic, Chicken Parmesan. We've kicked it up with some spicy Arabiatta instead of traditional tomato sauce and snuck in a piece of prosciutto for good measure ('cause who doesn't love prosciutto?). Enjoy with a glass of your favorite red wine! Trim and half each chicken breast. Pound flat with a tenderizer. Scramble the egg for batter. One at a time, coat the piece of chicken in egg and cover with breadcrumbs generously. Place in the frying pan to cook until golden brown, approximately 4 minutes on each side. Place chicken on a few paper towel when done to remove excess oil. the chicken flat in pan and layer 1 piece of prosciutto over each. Coat with enough additional sauce to cover chicken then smother with grated mozzarella cheese. Bake for about 15 minutes or until cheese is bubbly. Boil pasta until al dente or another accompanying side dish during this time. We like Rotelli as a great all-purpose pasta and regularly have it in our pantry. Garnish with a few fresh basil leaves and some greated parmesan cheese and enjoy!